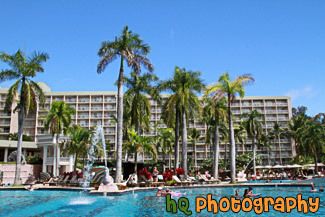 A scenic picture taken of a hotel Resort pool area located in Kauai, Hawaii. Blue sky is seen above with the pool and palm trees in the foreground. People are in the pool enjoying the Hawaii weather.